Vision Test: Which One Do You Need? When you go to an eye examination, there are many tests that your eye care provider can ask you to take. But it all depends on what it is that he is looking for, if he is checking for vision issues, or for other types of diseases or infections. Similarly, if you do not have any kind of symptoms and you just go to a routine check-up, it is more likely that you will be tested for common vision issues and diseases. This is what we wanted to focus on today. We are going to provide you with an overview of what is the most common eye vision test you can expect when going to an eye examination. Let’s begin! Before we get into more specific tests that you can take during an eye exam, let’s take a closer look at how such an exam usually goes, so that you know what you can expect. First of all, the doctor will be asking you about your medical history or if you are experiencing any problems with your vision. The next step is usually to measure your visual acuity and see if you need any glasses. Next, the doctor will most likely want to check your eye pressure, which means that he will put some drops into your eyes – don’t worry, it doesn’t hurt – and after your eye is numb, check its pressure or with an air puff test. This helps him look for glaucoma, a disease of your optic nerve. Then, naturally, the eye doctor will want to check the health of your eyes. And to do so, he will use several devices and a lot of light in order to properly see into your eyes. Most likely he will also dilate your pupils using eye drops, as this makes it easier for him to do his job. After all these routine procedures have been completed, you will have the possibility to discuss the results with your doctor, and ask him as many questions as you like about your eye health. This entire experience should last between 30 and 60 minutes. Now, there are a lot of other vision tests that your eye doctor can perform during an eye examination. These are usually more specific and they aim to test for certain eye vision problems. We are going to be looking at the most common today. This vision test is designed to see how good your vision is. 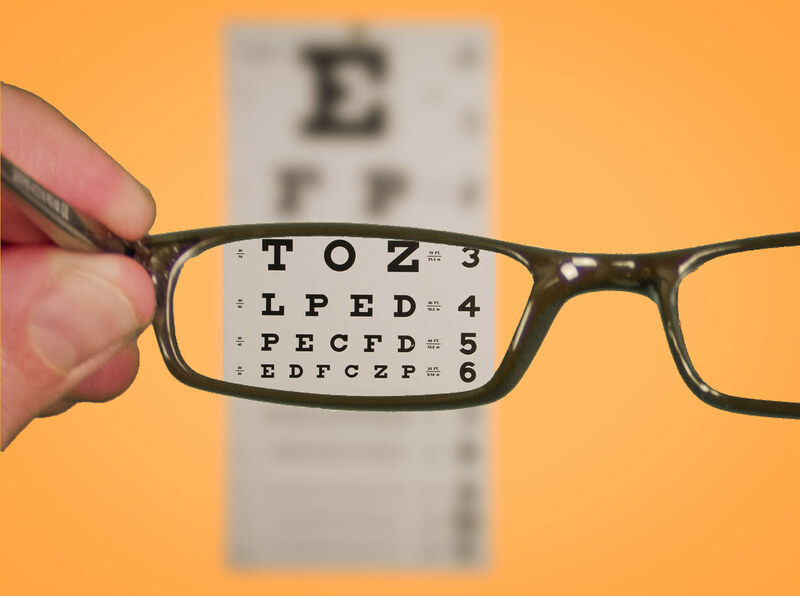 The most standard way in which to test for visual acuity is to use a chart (the Snellen chart) that contains several rows of numbers and letters of different sizes. The technician will ask you to cover one eye at a time and read what you see on the chart. With this type of test, you can also check your near and far vision by either holding the chart close to you, or far away in front of you. Usually, the chart that is far from you is placed 20 feet away unless you are looking in a mirror. This is where the term 20/20 visual acuity comes from. A 20/40 visual acuity is necessary for instance if you want to get a driver’s license in most states. Usually following the visual acuity test, the refraction test uses a device called a phoropter that switches between different types of lenses. What you have to do is say which one improves your vision. This vision test can also be taken by using a computerized refractor, which estimates what kind of prescription is best for you, or a retinoscopy, where your eye doctor uses a light and measures its reflection off your retina. All these possibilities aim to measure what is called a refractive error. This happens when the rays of light passing through your corneas cannot perfectly focus on your retina. This means that you might need contact lenses, glasses, or even surgery, in order to correct the issue. Depending on how severe the issue is, this test can help your doctor prescribe the best lens for your eye condition. Your visual field basically contains all the things you can see to the sides (in your peripheral vision) just by looking straight ahead. Testing this determines whether you have any issues perceiving objects that should be in your field of vision. There is more than one possibility to test this, out of which the most well-known vision test is called the confrontation field test. What happens here is that the doctor or technician will sit in front of you and ask you to cover one of your eyes. Then you will be asked whether or not you see his hand moving to the side of your eye, while looking straight ahead. Another way to test your visual field perception is through a tangent screen test, where you look at a screen, focusing on an object situated exactly in its center. While doing that, you will be asked if and when you see any objects moving to the sides of your eye. The automated perimetry test is yet another option for the visual field test. In this vision test, you will be looking at a screen that has flashing lights on it, and you will be asked to press a button every time the screen blinks. It can happen that you have trouble perceiving colors and you don’t even know it. In order to test for this, your doctor will show you different multicolored dot-pattern tests. For you to prove that you can see colors for what they are, you have to select certain shapes and numbers inside the dot-pattern. If you are struggling with this task, then it means that you do suffer from a color deficiency. As the name suggests, this vision test will allow your doctor to examine your retina. But that is not the only thing that he will be looking at. He will focus on the entirety of the back of your eyes, including the optic nerve and the blood vessels that keep the retina nourished. This is another kind of vision test that requires eye drops, because the doctor has to be able to clearly see all these structures before your pupil gets smaller when in contact with the light that he has to shine in your eyes. After the eye drops dilate your pupil, there are two techniques that the doctor may use to examine the back of your eyes. He will shine a light in your eye using a microscope, which will allow him to see the back of your eye clearly and he will examine you by using a condensing lens, while having a light strapped to his head. There our new technologies that can take images of the retina to view for disease without the dilation drops. This eye vision test will allow your eye doctor to look at your cornea, iris, the fluid chamber between the two, eyelids, and lashes. The slit lamp is a type of microscope that will help with this vision test. It contains a line of light that, combined with the fact that it magnifies your eye, helps your doctor get a clear view of what is happening there. The only thing you have to do is put your head and chin in the apparatus, and let them rest against the front of it. In some cases, your doctor might ask you if he can use a dye like fluorescein to color the tears covering your eyes. This is nothing to be worried about. It will only help him see if there are any damaged cells at the surface of your eye. And the dye comes off pretty quickly, as your tears will speed up the process. With the help of this extremely simple vision test, your doctor will measure how curved your cornea is, by flashing a bright light on your eye. This type of vision test is used in order to determine the right prescription for eyeglasses or contact lenses. If the power is not equally distributed all over your cornea, you might have astigmatism. It might sound strange, but during an eye examination, you might also get an ultrasound. This vision test is used by doctors when they want a clear picture of the internal structure of your eye. Using high-frequency sound waves, the ultrasound provides a much clearer picture of your eye than any other vision test. This vision test is usually used to look for ocular tumors, or looking at the retina when a hemorrhage is obstructing it. However, it can serve many other purposes. It is not a painful procedure, and it requires no extensive preparation. You will receive an anesthesia to minimize discomfort, and it usually takes between 15 and 30 minutes to complete. The next time you want to go to an eye examination, but you are rather anxious about what awaits you there, take another look at our comprehensive guide. Usually, if you go to a routine check-up, the doctor will perform a series of vision tests, none of which are painful or scary. But in order for you to feel more relaxed, we have taken the time to go through what are the main steps of an eye examination, and what are the most common tests that you should expect. We hope you find this useful!